Vodafone Italia and Telecom Italia each spent €2.4 billion to grab the largest share of spectrum on offer in an Italian auction of 5G-suitable frequencies, which raised €4 billion more than the minimum amount targeted by the government. All four of the country’s operators secured spectrum. Newcomer Iliad Italia spent €1.2 billion, while Wind Tre acquired licences to the value of €517 million. In a statement, Italy’s Ministry for Economic Development said the auction generated “lively competition” especially for the lots of 3.7GHz. 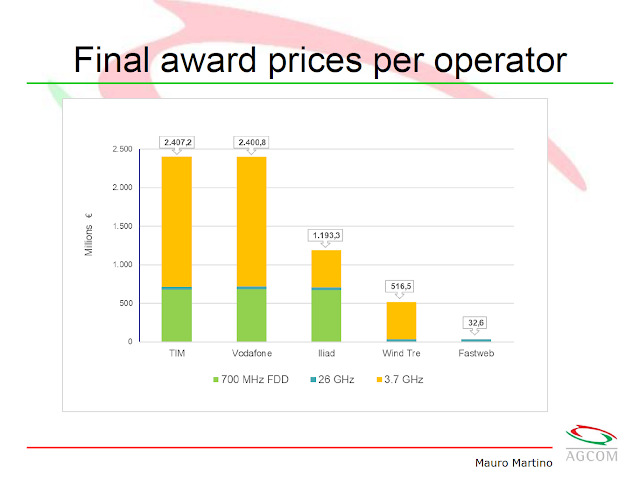 In that band, Vodafone and Telecom Italia were both awarded 80MHz at a cost of €1.7 billion each, while the other two operators secured allocations of 20MHz for €484 million apiece. Telecom Italia and Vodafone Italia also bought 200MHz of 26GHz (mmWave) and 20MHz in the 700MHz band. Iliad won 200MHz in the 26GHz band, alongside its 20MHz of 3.7GHz and 10MHz in the 700MHz band. Wind Tre acquired 20MHz of 3.7GHz and 200MHz in the 26GHz band. Licences are valid for 19 years, with the exception of 700MHz allocations, which will not be released until 2022 and cover a term of 15.5 years. The home of Nokia yesterday wrapped up an auction of spectrum in the 3.4-3.8GHz range that raised just €77.6 million ($89.3 million) for the government, barely enough to refurbish some local saunas. 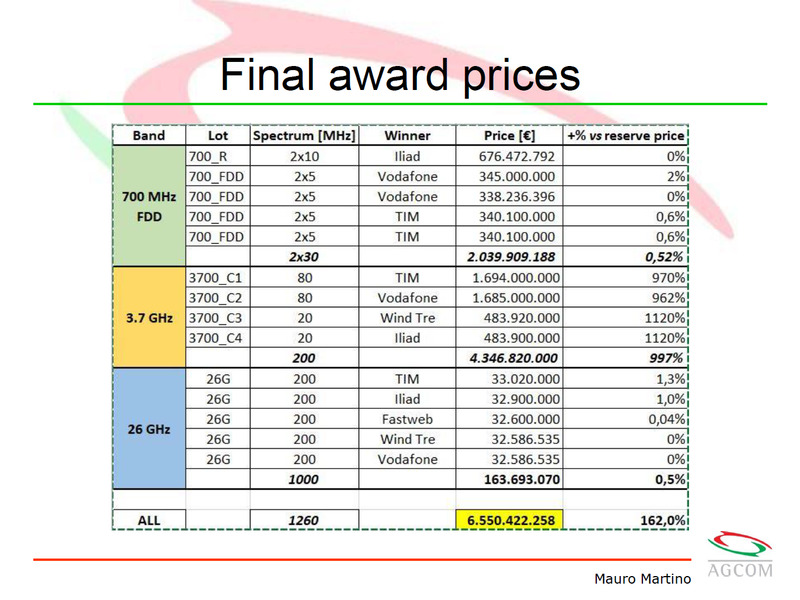 Italy's runaway sale of 3.6-3.8GHz spectrum, by contrast, yesterday passed the €6 billion ($6.9 billion) milestone. Assuming the government doesn't waste it on celebratory Prosecco, the eventual windfall could plug more than a few holes in the public-sector purse. Finland's auction has been restrained for a couple of reasons. First, the government decided to auction three very large spectrum blocks of equal size. Second, the Finnish mobile market has effectively consolidated into a three-player affair, a ménage à trois in which everyone is reasonably content. Consequently, Telia Finland, Elisa Corp. and DNA Oy each walked away with a 130MHz license that did not come at eye-watering expense. While Telia Company shelled out the most with a €30.3 million ($34.9 million) payment, no operator spent dramatically more than government base prices of either €23 million ($26.5 million) or €21 million ($24.2 million), depending on the allocation in question. Elisa and DNA paid €26.3 million ($30.3 million) and €21 million ($24.2 million) for their concessions, respectively. In Italy, the government appears to have chopped a 200MHz block of spectrum into four uneven chunks, two of 80MHz and two of 20MHz. 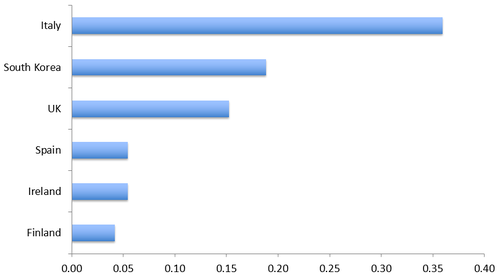 A 20MHz channel would not really be enough for most advanced 5G services, though, and operators know it. Four of them are fighting over these airwaves after competition authorities recently opened the door to France's Iliad, one of Europe's most aggressive mobile operators. Their aim was to prevent Italy from consolidating into a dreaded three-player mobile market with the merger of 3 Italia and Wind. It will be interesting to see how it works out in 5G and if operators are still able to deploy a 5G network that is compared to other European countries.